Plant assembly of the world's first Variable Density tunnel boring machines (TBMs) at Herrenknecht in Schwanau. They can be operated as an earth pressure balance shield and as a Mixshield. The seven million inhabitant metropolis of Kuala Lumpur has a huge traffic problem. At peak hours citizens and visitors in the Malaysian capital stand in traffic jams for hours. To provide relief, the public transport system is being expanded. Under the name of Klang Valley Mass Rapid Transit (MRT) Project three new metro lines are planned with sections above and below ground. Construction of the metro began with the 51 kilometer long Sungai Buloh-Kajang Line. It extends from Sungai Buloh in the north to Kajang in the south of Kuala Lumpur. While the majority of the route is above ground, the city center is crossed under with a total of 9.5 kilometers of tunnel in the form of two single-track tunnels. A special challenge in their construction is the very heterogeneous geology, in particular a karst limestone formation with caverns connected by a network of crevices and fissures. For tunnelling, in combination with a high level of groundwater it forms a highly diverse subsoil. The liquid support medium used ahead of the machine in heterogeneous ground is easily lost through the cracks. Subsidences can occur as a result. 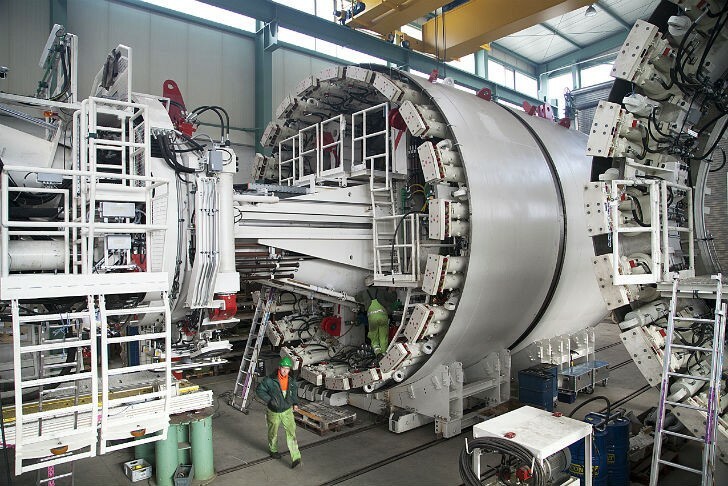 For the construction of the section, Herrenknecht with engineers from MMC-Gamuda Joint Venture therefore developed a new type of machine in Schwanau, the Variable Density tunnel boring machine (TBM). It is a further development of the multi-mode TBM, which combines the advantages of the earth pressure balance (EPB) and slurry-supported (Mixshield) modes. To prevent the loss or leaking of bentonite the density of the support medium can be increased. The machine thus offers four different tunnelling modes (see Machine data for an overview) - a world first in mechanized tunnelling. Herrenknecht supplied a total of six Variable Density TBMs and two EPB TBMs for the project. The innovation claimed international fame when it was awarded Technical Innovation of the Year Award in 2014 by International Tunneling and Underground Space Awards in London. On April 21 the client Mass Rapid Transit Corporation Sdn Bhd (MRT Corp) celebrated the completion of tunnelling for the first line. Star of the event was the Herrenknecht tunnel boring machine S-774 (Ø 6.62 m). The world's first Variable Density TBM was launched in May 2013 in the presence of Malaysian Prime Minister Datuk Seri Najib Tun Razak. Ahead of her lay a one kilometer long section through extremely karstified Kuala Lumpur limestone. The machine started the advance in the usual slurry mode, and then switched to the new mode with a denser support fluid after the first 100 meters. In this mode it mastered the planned tunnel section from the launch shaft at Cochrane to the Pasar Rakyat station with flying colors. Because of difficulties sinking the shaft the Variable Density TBM planned for the following section could not be used. Instead S-774 continued on past its target station and took over the next section. Over the course of the longest partial section, more than three kilometers in length, the machine moved out of the limestone area and into the Kenny Hill Formation. From here it bored its way through the Bukit Bintang station to the Pudu shaft in EPB mode. There it continued tunnelling instead of the planned EPB machine, crossed through the Merdeka station and finally reached the Pasar Seni station on April 11. In total the machine drove 4.4 kilometers of tunnel through greatly varying geologies. With the four available tunnelling modes, optimal adaptation to the prevailing conditions was possible at all times. "This is truly a milestone for the MRT project, our engineers have completed the tunnelling work successfully and smoothly. At the same time the use of a new technology has proved itself – the Variable Density tunnel boring machine," said MRT Corp Chief Executive Officer Dato´ Sri Shahril Mokhtar. There are three types of ground conditions in Kuala Lumpur, hard granite rock, a softer mixed geology known as Kenny Hill Formation, and limestone areas. The new metro line runs through the last two. The business partners Herrenknecht and MMC Gamuda KVMRT already had extensive experience of the ground conditions from their cooperation for the SMART tunnel. The combination of stormwater and road tunnel was excavated from 2004 to 2007 with two large Herrenknecht Mixshields. The drive was very successful, but the geology revealed its pitfalls. 90% of the SMART tunnel route ran through karstified Kuala Lumpur limestone with a high level of groundwater. Fissures and crevices sometimes resulted in suspension leaks on the surface and losses into the ground. What had been acceptable on that particular route had to be avoided this time in the densely built-up inner city. To solve the dilemma the idea of a denser supporting suspension was developed, whose reduced penetration depth and capillary rise in comparison to the previous suspensions could prevent uncontrolled losses. Together with the joint venture building contractor MMC Gamuda KVMRT, Herrenknecht developed a game changer for soft ground for the project. Depending on the ground conditions, the new Variable Density TBM can be operated in either slurry-supported (Mixshield method) or earth pressure balance-supported (EPB) mode. The change from one mode to the other takes place smoothly while fully maintaining secure face support control, major modifications are not needed during the switch. In all modes the excavated material is removed from the pressurized excavation chamber by a screw conveyor. In EPB mode the screw conveyor speed and the advance rate control the face support pressure. The screw conveyor drops the excavated material onto a belt conveyor. In slurry mode the face support pressure is automatically controlled by an air cushion. Communicating pipes connect the front part of the excavation chamber, the pressure chamber, with the rear part, the working chamber. For the hydraulic slurry circuit a slurryfier box is used at the end of the screw conveyor. In addition, in slurry mode it is possible to vary the density of the support medium in the excavation chamber. In cooperation with the Ruhr University Bochum, Herrenknecht AG developed a mixture thickened with limestone dust. The choice between the more fluid LDSM (Low Density Support Medium) and the denser HDSM (High Density Support Medium) considerably increases the areas where variable density can be used. The high density mode closes the gap between Mixshield and earth pressure balance operation. "With the experience from KVMRT and with Herrenknecht's expertise, with the new Variable Density technology we have opened a door that will allow us to tackle even more difficult geologies. The Variable Density TBM concept can be used not only in extreme karst, but also in other soils where only a few years ago mechanized tunnelling was still unthinkable," Dr. Ing. E. h. Martin Herrenknecht, founder and Chairman of the Board of Management of Herrenknecht AG, is certain. With the breakthrough of the Herrenknecht tunnel boring machine S-774 the tunnelling work is completed and an important milestone for the project has been reached. At the same time a world first in mechanized tunnelling has proven itself. Altogether Herrenknecht AG has supplied six Variable Density and two EPB machines for the KVMRT project. Herrenknecht Formwork supplied 160 moulds to produce a total of 100,000 concrete segments. Herrenknecht Group companies also supplied belt conveyor machines (H+E), navigation systems (VMT) as well as Multi Service Vehicles (TechniMetal). The "Blue Line" Sungai Buloh-Kajang is the first of three planned lines of the Klang Valley Mass Rapid Transit (KVMRT) project in Kuala Lumpur. It connects 31 stations over 51 kilometers. In February 2015 the government decided to build the second line, MRT Sungai Buloh-Serdang-Putrajaya. In July the MMC-Gamuda KVMRT joint venture has been assigned to carry out the project. The variable density technology has provided its own best recommendation and will be used again. The Herrenknecht TBM S-774 during assembly in the Cochrane launch shaft. From here it excavated a total of 4.4 km of tunnel right through the center of Kuala Lumpur. Breakthrough of the Herrenknecht TBM S-776 into the Passar Rakyat station on January 9, 2014. The sister machine S-774 continued through the station and excavated a second and third section. An innovation celebrates its breakthrough: with the arrival of the Herrenknecht Variable Density S-774 on April 11, 2015 all tunnelling work for Kuala Lumpur's first metro has been completed. The new Variable Density TBM combines the advantages of EPB and Mixshields. In addition, the density of the support medium can be varied. Four different tunnelling modes provide maxiumum adaptability to the prevailing conditions in difficult soft ground. The world's first Variable Density TBM, S-774, drove In total 4.4 kilometers of tunnel through greatly varying geologies. With the four available tunnelling modes, optimal adaptation to the prevailing conditions was possible at all times.